The Twisted Tail offers progressive American Cuisine with welcoming southern hospitality. Come and be a part of our wonderful team! Our host team is the face of the restaurant and as such must be upbeat and presentable at all times. High levels of organization are important and multi-tasking skills are a must. If you are interested in part time or full time position with us, please come in and fill out an application. 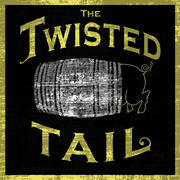 The Twisted Tail is a privately owned restaurant and bar in the heart of lively Headhouse Square. We specialize in Progressive American Cuisine, American whiskey and American Blues. We brand ourselves based on family....family style menu, family attitude among employees, treating our regulars as family and welcoming each guest as if they are walking into our family home. Warm, friendly and accessible. We strive for excellence and hold ourselves to a high standard of service and quality of product, but deliver in a recognizable and appealing fashion.